This was taken about 2 p.m., from my deck. That was after we'd driven home from town, through a variety of conditions including high winds (trees across roads); rain (almost horizontal); slushy sleet; and then brilliant hot sunshine with a magnificent rainbow. That dark band across the lake by the point? That would be rain coming in again... but that little line of silver in the background? That is more sunshine, also headed our way. And it's beautiful. It also illustrates one of life's little lessons... the sun is still out there, still shining, and it's coming your way, so just hang on! That's something we sometimes forget as we roll into November, the month that is synonomous with gray weather. There's all kinds of beauty out there, and bad weather always looks worse through a window! Living a bit off the beaten track, we don't get zillions of kids trick or treating, but we get enough to make the night fun. We had witches, Goth Girls, Spiderman, cowboys and a giant chicken named Arnie Schwartzen-EGGer, among a host of others who collectively seemed to have enough sugary swag to carry them well past next Easter. One of the Mom's came dressed as a Nurse -- she may find her services needed quickly if the kids get ahead of the curve eating all that stuff! The great thing is you just never know who's going to drop by. At one point, in the living room, I discovered the most unlikely trio -- Capt. Jack Sparrow, Tina Turner and Marilyn Munroe had all dropped by at the same time! While I love to carve pumpkins, they never last. In fact, the challenge is to keep them intact until at least the candles burn out! The deer move in, and that's the end of Jack 'o Lantern! Oh well, I suppose the deer, too, enjoy a little treat at this special evening in the year! Wintergreen mints -- you know them. You might not have known that you can create lightning in your mouth with one of these Wint-o-Green mints. If you didn't know that, you missed a chapter in your childhood... How to do it? Go into a dark space, with a mirror... This works best if your mouth is a bit dry, so try to get to that state... then pop in a mint, and with your mouth open, crunch it with your teeth. The fracturing of the sugar causes a tiny lightning charge to jump across the broken pieces, and yes, you can see it. You can also figure out to explain to your friends what you are doing, crunching mints in the dark in the bathroom... but that's another story. When it's not appearing as a white mint, ready to light up your mouth, wintergreen is one of our forest plants that stays green all through the winter. Also called Eastern Teaberry (yes, you can brew tea from the leaves) it has a host of medicinal uses, and lovely red berries that brighten up the autumn days. Who doesn't enjoy getting outside on a sunny autumn day? Squeegee pony took his person Judy for a lovely long walk recently. Of course Achmed the cat had to come along. And check out everything... including climbing into the wild apple tree for a better view. The bowl you are looking it has a name. And an history. Not to mention a "WOW!" factor. The name? In Ojibway, Mikwum Shingwauk. It translates to "Ice Pine." 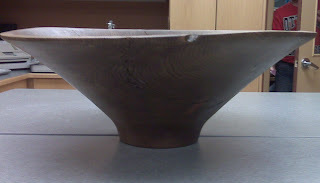 Why does a bowl turned from an old burl on a tree merit a name? Because it dates from 6631 BC. The tree was found in 2005 at the old Beaumont Farm in Bracebridge. They were digging a pond at the time, and 16' down, they came across this white pine. Now the Beaumont family settled that piece of land -- nobody has put a shovel into that ground to that depth to bury a tree that size. Max Beaumont called in Don Thur, who's artistic expertise is in creating fantastic works of art from burls and sections of woods. His gallery, Knots and Burls to Bowls, is in Utterson. Don got as excited as Max about this tree, and they decided to get it properly dated. A forestry expert determined that it was a white pine, 261 years old when it fell. Which was fine, but how long had it lain fallen? The folks at the IsoTrace radiocarbon lab were initially a bit 'ho hum', but that was before the results came back. That's when everybody snapped to attention. It's life cycle ended in 6370 BC, during a cataclysmic event during the recession of the Glacial Lake Algonquin -- that's the lake that once upon a time covered all of Toronto, and held all the Great Lakes merged as one. (you can go look it up) There were traces of limestone on the tree that link to the Kingston area, indicating a huge back-flush of water at some distant time. In fact, to get that distant time, experts take the 261 years the tree grew, the date it fell (6370 BC) and the year it was found and dated, AD 2006. Ice Pine first held up its proud branches 8637 years ago. That's the Wow Factor. Don Thur was commissioned by Ann Rachan of Toronto to create this gorgeous bowl for presentation to the Township of Lake of Bays. It is on view in the lobby of the Muncipal Office, if you are passing through. It's more than worth a look. Labels: Ice Pine. Township of Lake of Bays. Don Thur. Knots and Burrs to Bowls. ancient timber. Beaumont Farm. 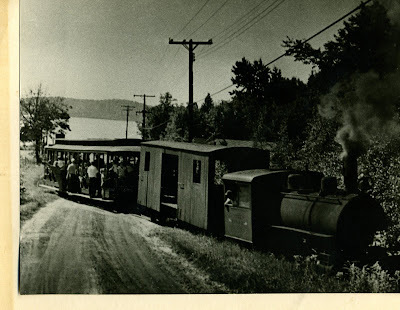 Charles' Cooper's Railway Pages has put up a great post about the famous little Portage Flyer railway -- a lovely nugget from the history of the Lake of Bays. Here, the steamer would bring them to the dock at the Pen Lake Post Office, the northern terminal of the Portage Flyer train. This brave little narrow track train ran for one mile -- North Portage to South Portage... then back. It wasn't as easy as it sounds -- a 7% grade up from the lake at North Portage meant that if the train was heavily loaded the gentlemen had to disembark and walk up the hill. 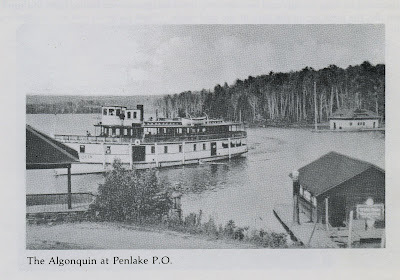 At South Portage, the S. S. Iroquois, and the S. S. Mohawk Belle (once called the Mary Jean) would be waiting to take passengers to the various destinations around the lake. Charles has done an excellent article on this unique railway, and we're happy to add some photos to the collection! Labels: Portage Flyer. 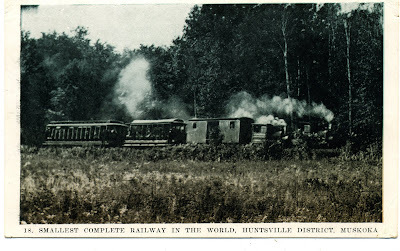 Charles' Cooper's Railway Blog. Lake of Bays. Our chipmunks have been busy stuffing their dens with seeds so they'll be ready to snooze off and on through the worst of the weather this winter. The squirrels, however, just keep on trucking... They will be be-devilling the bird feeders all winter long. 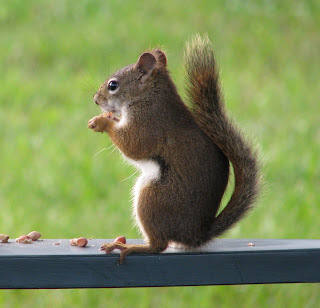 That doesn't mean they haven't been enjoying themselves this summer, scooping up treats put out for the chipmunk for example, or scoring big on bird seed, or just plain gleaning out the sunflowers and corn in the garden. They have. They very much have. I'm very fond of this photo. 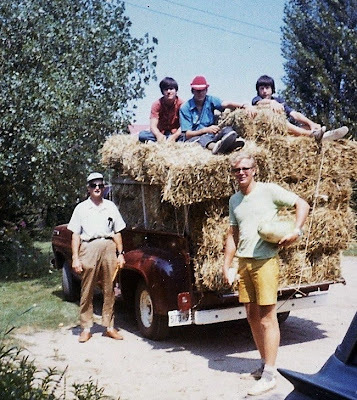 From the mid-70's, it shows us bringing home a load of hay for the horses... What it doesn't show is that those three intrepid lads rode home on top of the load, with Rob (on the right) calling out, "Hay, Man!" to passersby when we stopped at the lights. It's unthinkable now, but those were less complicated, one might say less worried times. We laughed a lot. With Paul and Brian Tapley standing on the ground, the picture is completed by three members of our long time Bondi Family: David Williams, David Horne, and Rob Williams. When there was trouble to be found, they were always right in there with Brian and I... when there were chores to do, they were always willing to pitch in. We had some amazing adventures, and knowing them made the summers rich beyond imagining. The Williams have been coming to Bondi without interruption for 48 years now. The next generation comes with their own families, and we hope that these families will in turn come with theirs. We are part of their lives, and they are a very cherished part of ours. Many of our guests who met at Bondi continue the same close family-ship when they leave here to return home. Many tell us that Bondi is their anchor, and that is an enormous honour. David was an avid runner, golfer and lover of jazz, travel, good food and laughter. David was a loving and gentle soul. A devoted family man committed to his wife and son. David has a deep love for Christ. He will be loved and missed by his family and friends but will live in our hearts and memories forever. Our world was brighter for having him within it. Down at the shore yesterday, Brian and I were contemplating how low the water is. Despite all the rain, the lake levels have been pulled down to as low as we have ever seen them. 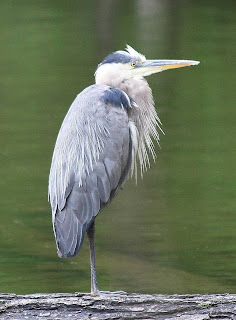 While we were there, a heron drifted past us, only a few feet away from where we stood, low and lazy on his outstretched wings. The mergansers fished past, heads ducked under the water, checking for minnows. And a whole gang of mallards came dabbling along the water's edge. Not everybody has left for the season, evidently! 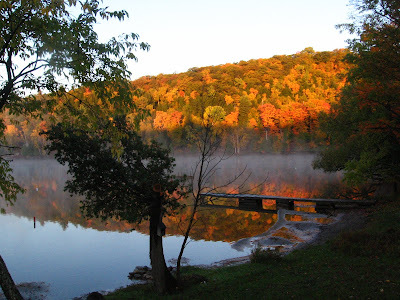 As Chair of the Township of Lake of Bays Heritage Advisory Committee, it is no great surprise that Nancy is deeply intrigued by the history of the Lake of Bays. Things change, nothing stays the same, but that sense of where we've come from helps us with where we're heading. The joke runs that Europe has too much history, Canada has too much geography, and there's quite a lot of truth in that. (there's another that says that in Europe 100 miles is a long distance, in Canada 100 years is a long time, and that's also true) All the same, there's more history here than most people suspect. Lake of Bays and Muskoka did not just fall from the sky as cottage country destinations, and the journey has been quite a ride. 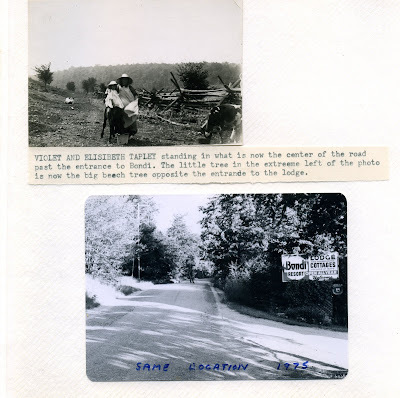 We've added an historical slide show feature to the Blog. You'll find it just below the Archive Index. While the images are small on the Blog site, if you click the photos, it should take you into the larger version, where you can spend some time studying these pictures. We'll keep adding more as we get the chance! We had wonderful staff at Bondi this summer, both Shahira (who is now at Queen's and yes, she made the varsity Swim Team. Go Shak!) and Mike (who is heading off to work at Panorama, B.C. for the winter as a ski instructor). They made our summer so much easier, and so much more fun. Mike pulled out yesterday -- his last official job was helping Brian put up snowfences. He's had some wide-ranging experiences working here for the summer... not the least of which was the engineering and construction of the fabled BBQ Barge. From Paintball with Team Bondi to folding towels in the resort laundry, Mike -- when he could find time in between text messaging. We're going to miss him, that's for sure, but we know he'll be back... and come December, we know where to find him, at Panorama Mountain... and he and Dave sewed their own ski bandanas this summer, so we'll know how to recognize them. Best of luck, Mike, in everything you do! An international calibre course builder, he's the man who built Nancy's training fences for the horses in the back fields -- and hopefully he's going to be able to get here for at least one more day of building/repairing before he loads his bike up and heads south. He dropped by yesterday, testing his gear. After all, the forecast was for cold winds, rain, and rather nasty conditions. Just what might be expected in sections of Patagonia at this time of year. It's not a trip to the beach that Hugh is taking on! It took him 9 hours to ride (mostly uphill) to Bondi, from his home near Bobcaygeon. We took photos of his bike, 'Jaunita', and made sure he had a good hot supper. He then set up his tiny little 'house' on the lawn. How tiny? Well, despite best efforts, there was just not enough room for Achmed the cat to climb in with him. The equipment available nowadays is truly remarkable -- lightweight, compressible, weather proof. Since there was a very hard frost last night, we left the door open, so he could crawl in next to the fireplace if required, but this morning he reported that he had been 'toasty warm'. The deer looked mildly puzzled to find this tent in their midnight midst, but Hugh was undisturbed. He packed up this morning, (with a little supervision from Achmed) and headed home. We figure 8 hours for the ride back -- after all, it's downhill from here to Bobcaygeon! Nancy has helped him set up his own Blog, (yes, he has researched the fact that there are internet cafes along the trail!) so hopefully we can all follow him on this wonderful adventure, even if we ourselves aren't quite up for the challenge! His Blog site is very new, so he's just getting started on it. There is a bike race that follows much the same route as Hugh has planned -- it goes every year, starting in August, following this map, but Hugh prefers to go it alone. If you'd like to sneak a peak at the sort of country he'll be cycling, you can click here. Labels: Andes Trail. Patagonia. 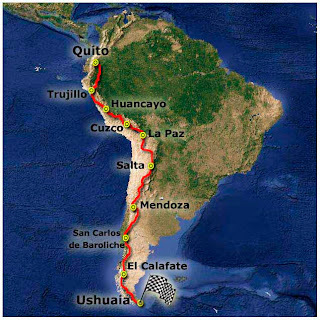 South America cycling tours. Bondi Village Resort. Hugh Morshead's Blog. This is the best time of year for stunning sunsets. Here's another in our collection. Kind of makes you wish you could paint, doesn't it? 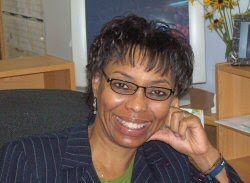 As after-dinner speakers go, Rosita Hall is a keeper. She was sitting at the same table with us at the Resorts of Ontario dinner, so we got a little bit extra chance to chat with her. Then, as the coffee was poured, she bounced up out of her seat, grabbed the audience, and had everyone laughing within moments. Remember what's important, she reminded us -- choose the three things you can't live without, and be sure they are included on your to-do list every day. That could be family, health, a long-held passion for an activity. It's up to you, but it's also up to you to take that time, to include what matters. Laugh. Laugh often. Laugh till it hurts. Choose laughter. Let stuff go... and never forget that the heart will light your way through the darkest of the dark. It's so easy to get so deeply enmeshed in the 'have-to-do list' that we sometimes lose sight of the who that's going to do it... That would be each of us. Thanks Rosita for reminding us that we are all okay, we are all special. For reminding us to look after ourselves. To listen when our bodies and minds point out that we are perhaps over-extended. To take a vacation (Bondi has vacancies, by the way... what better place to find yourself if you have slightly lost your compass than here???) To take a breath. We each of us are our own best asset... and it's a beautiful, funny, energetic world out there. It's good to be reminded of what's important, and it's good to laugh with friends. 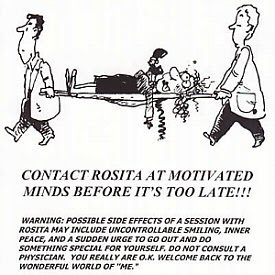 Thanks Rosita! Labels: Rosita Hall. Resorts of Ontario. The Fall meeting of Resorts of Ontario (Carol insists, and we think with good reason, that the "of" is extraneous... she prefers just Resorts Ontario, but we digress) is happening at our neighbouring resort, Port Cunnington Lodge and Resort. Port Cunnington has deep roots in Lake of Bays. In 1905, when Joseph and Elizabeth Tapley arrived by lake steamer, this was already an established guest house, and this is where they stayed.The boathouse looked much as it does in this old photograph. Over the years it has grown and changed -- as all resorts must -- but a great deal of the history has been treasured and preserved. The Wadsworths' have been diligent in restoring the property, while modernizing, and it currently boasts one of the best dining rooms in the area and is hugely popular with wedding parties. Signs of the modern times can be spotted right away -- the bank of new solar panels is impressive, as are the solar water heaters now also in evidence. From Port Cunnington, the participants in the seminar came on a Fam Tour (familiarization tour) to see some of the other resorts in the area. Including Bondi. With a quick tour, some of the resort history and a little entertainment from the chickens, they were whisked about several of the cottages and along the waterfront before climbing back on the bus, heading back for dinner. These are our fellow resort operators, our friends and our neighbours, all of whom work really hard to provide quality vacations to meet every occasion, every budget, every holiday dream. And we think they're a pretty cool looking crowd! Labels: Resorts of Ontario. Port Cunnington Lodge. North Muskoka accommodation. Bondi Village Resort. If it's the weekend after Thanksgiving, then it must be the Bala Cranberry Festival. In fact, it's the 25th anniversary of this "must do" festival. Bala is a beautiful town, in the heart of the pink granite of Muskoka. Add to that pink granite the bright splash of the red cranberries, and it's very pretty around there! There's so much to do at the Festival that I don't know where to start, so I'll simply link you over the Jenn Jilks' Blog. Jenn's a volunteer at the Festival, and has some fantastic posts up about it. We have guests who come every year to stay with us, and their day out at the Bala Cranberry Festival is one of their annual highlights. Not to mention, you can scoop up enough cranberries to keep your larder stocked all year long. You should circle this weekend on your calendar. Come on up. Labels: Bala Cranberry Festival. Jenn Jilks My Muskoka. Bondi Village Resort. Festivals. There's still a lot of colour to be seen on the hills. The hot reds are burning down into the yellows, golds and bronzes of the trees that change later than the maples, but it is still breathtaking against the dark greens of the evergreens. It is water, however, that truly tells us that the season is changing. I was at Marsh's Falls this week, and at the base of the falls, where the water tumbles and leaps, got this shot of the water hanging as icicles on the overhanging branches. And then thoughts turn to Christmas -- Bondi Village has a long history of providing memorable Christmas vacations for families. You can cut your own tree, the kids can play with all their new winter toys, everyone can be reminded that winter in Canada should really be a season to celebrate, not to avoid, and that is best done up here in the north, where the snow is white not gray, the skies are blue, everything sparkles, and you can still toss the occasional snowball around! Labels: Bondi Village. Winter Vacations. Christmas specials. We used to have a wonderful cat, Willow, who could not only go up the vertical ladder into the stable loft, but could (very carefully) come back down. It was an adventure, this descent. It's easy for a cat to fall off a vertical ladder built into the wall... So Willow would hop down onto the top rung, then quickly twist his head and front legs down the back of the ladder, so he was held in place by the wall. With front legs on the next step down, it was just a matter of waiting for his rather round tummy to sift it's way down past the rung, then kick his hips sideways, land on the next step... and repeat. It was a hoot watching him in action. Our current cats, Napster and Achmed, have both (dare we use the word) chickened out on this methodology. It is full of risk, and Napster's body shape is not really designed for leaping about in the rafters. Achmed lacks the patience. Up Napster would go -- the summit attempt was usually a success... and then he would peer down with a wistful expression, yowling, until someone climbed up and rescued him. That someone was far too often Nancy. A cat ramp was constructed at the other end of the stable. This was lovely -- it let him climb up at a more leisurely pace, spend some time at the Base Camp getting acclimated before completing the summit attempt. And it let him come sliding back down. That was the issue -- claws don't work well in that direction. It acquired a strip of carpet. And then a hammock at Base Camp, which is a huge hit with Achmed on hot summer days. And now she's got some of the other chickens wandering up with her. It's a popular spot, up there in the high altitude. Today was the day most of the Muskoka Chairs went back into storage for the winter. We only leave a few out once the weather starts to chill down (it was 8 below tonight!). Brian and Mike spent part of the day collecting the rest from the cottages. 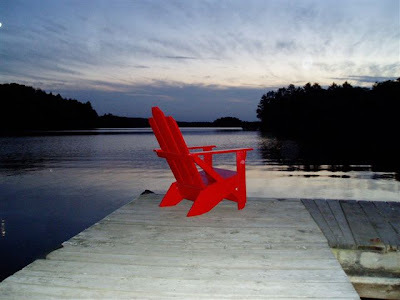 So it won't be until next summer that we can try to match David's photo of the chair on the end of the main dock! If sunsets paint the sky incredible shades of colour, then sunrises should not be overlooked either. At this time of year the morning lake is often adrift in mist -- which slowly fades to reveal reflections in the water. Michael took this shot from in front of Cedars cottage on the Thanksgiving weekend. We got a bit of every kind of weather that weekend... but a sight like this to start the day just cannot be matched. Thanks for sharing this Mike! Labels: sunrise. Bondi Village. Lake of Bays. As this Thanksgiving weekend draws to a close, it's good to consider all we have to be thankful for. Here at Bondi, our cottages were filled with families -- getting together, spending time away from the usual hurry of their lives and using that time to reconnect. People hiked trails, drove through the autumn roads to exclaim at the brilliant colours, cooked feasts. The ski boat was out -- but they did confess they didn't ski this time, just enjoyed the lake. Some went fishing. Rumour has it turkey was on the menu rather than fish, but it remains unconfirmed. And for the first time this summer, every single set of the Disc Golf frisbees was in use at the same time. Janice's gang of avid disc golfers took the Frisbee Golf Course by storm. Al reported hearing the wolf pack Saturday night, but they didn't answer Nancy when she did her best Wolf Karaoke on Sunday night, so perhaps they were just passing through. It's wonderful to see everyone enjoying themselves. The weather co-operated -- although it did provide a quick sampling of every one of the Canadian seasons, running the gamut from hot and sunny to a short snowstorm. It's true what they say, "if you don't like the weather, just wait five minutes, it will change." And if anyone thinks this is the end of the autumn colour season, we have news for you. While Algonquin Park is at peak colour, we still have a week or more to go before we are at peak. (you can see that in the hill behind the photo of the boat in this post) That's because our altitude is a little bit lower than the Park's, so our trees can hang onto their leaves just a little longer. If you couldn't get north for Thanksgiving, there's still a window of opportunity. Maybe the wolves will rove back this way and sing for you. And the wild turkeys won't mind if you, too, "play through" on the back fields frisbee golf course. Labels: Bondi Village. autumn colour tours. Frisbee Golf. Disc Golf. Muskoka. He has sent us links to two of his favourite vacation moments, which we are delighted to share here. "The first video is our little friend Chippy. He jumped on me before we were even finished unpacking the van looking for nuts. After that, he came looking for us every single day. I miss him, but he certainly has enough food to last him through the winter. Watch how he stuffs his cheeks until they are absolutely full!" 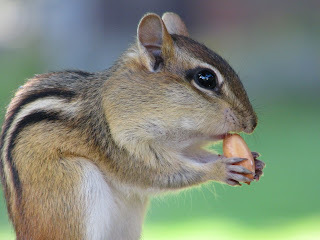 It's a hoot watching Chippy work diligently and with utmost determination to fit in that one last peanut! I don't know how many nuts got wedged into those cheek pouches, but it looks like that little 'munk won't be going hungry anytime soon! The second video post he sent was with Kelly, who was lucky enough to encounter the one doe who will actually eat from your hand. We think she hails from Lumina Resort, where we have insider knowledge that the chef sneaks treats out to her while doing salad prep... Our does, with their fawns at foot still, will come very close, but not this close! This picture is of one of the two sets of twins here this summer -- a boy and a girl! It was taken near the apple tree at my house about a week ago. All their spots are gone now. Syl's comment was that "this second video is a little more of a rare occurrence. Remember this is not a petting zoo. These are wild animals. And yet on one evening, and only on that one evening, this deer came and ate right out of our hands. We had a bag of baby carrots, and she wasn’t about to stop until she had the whole bag." Thanks so much for sharing, Syl and Kelly! Labels: feeding chipmunk at Bondi Village. feeding doe at Bondi Village. Wildlife. Kate Bennett McNaughton's lovely courageous mare Call Me Madam was laid to rest in our back fields October 9th. 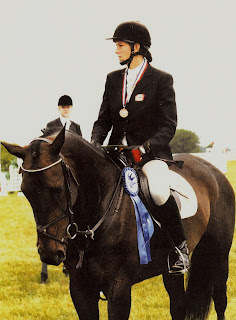 In her 25 years, this horse carried her young rider up through the competitive ranks to win a gold medal at the North American Young Riders Championships in 1996, and took her back there a second time in 1997. Eventing is the most difficult of the equestrian disciplines, combining the elegance and precision of the dressage, the speed and courage of the cross country jumping, and the disciplined accuracy of the show jumping. It takes a very special horse to excel at the higher levels, and it demands a deep bond of trust between horse and rider. Throughout her life, Madam never once gave less than her best, and her connection with Kate was inspiring to see. 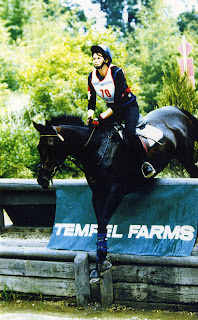 When Kate went to University, Madam went briefly on loan to undertake training a new rider - Caroline Morshead - at the Preliminary and Intermediate levels of the sport. 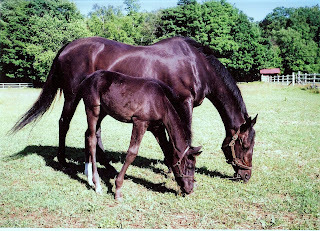 When age and injury limited her competition career, she came home to Fox Point Farm, at Bondi, to retire, taking Kate on rides through fields and forests, and four years ago presenting us with her wonderful talented daughter, All About Me (Abby). 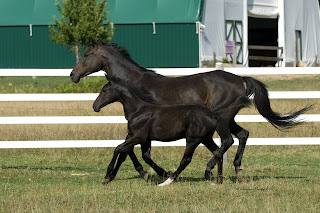 While she had abundantly loved galloping and jumping, always competing with ears pricked and eyes bright, motherhood brought this mare such a deep abiding joy that you could not help but smile whenever you saw them together. In their 20 years together Kate and Madam forged one of those rare precious bonds that go beyond all words. Madam was always safe in Kate's hands, and Kate was always safe on Madam's back. Together they had magical wings that carried them far. And at the last, still safe in Kate's hands, the mare has gone to a place without pain, where she can gallop unencumbered by earthly restrictions. We'll miss her. We'll cherish her reflection in Abby. We'll never forget her. The Best Gifts to "Man"
are the Horse and the Hour. and was glad in the giving. and life was worth living." "Horses - if God made anything more beautiful, He kept it for Himself." Two by Two? Not Really.